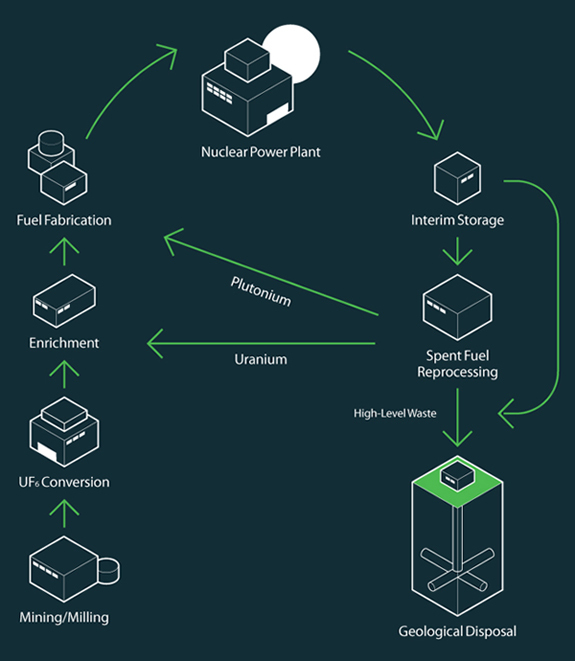 The nuclear fuel cycle for the light water reactor (LWR), the most prevalent in use today, is illustrated in the figure below. The cycle consists of a “front end” that comprises the steps necessary to prepare nuclear fuel for reactor operation and a “back end” that comprises the steps necessary to manage the spent nuclear fuel, which is highly radioactive. It is possible, as shown, to extract the unused uranium and plutonium from spent nuclear fuel through chemical reprocessing and to recycle the recovered uranium and plutonium as nuclear fuel.